At Brilliance, we are so proud of our Meteorite Collection, a line of men’s rings that feature gorgeous pieces of the Gibeon Meteorite. These rings use dark metals or contrasting finishes to highlight the unique beauty of meteorite, creating a one-of-a-kind pieces of jewelry that are truly out of this world. But why should the men have all the fun? After all, meteorite can be just as flattering on a woman’s finger. At Brilliance, we pride ourselves on our ability to create custom pieces that are just right for the love of your life, and the meteorite collection is a highly customizable line. If you think she’s a real star, then give her a ring with a little piece of heaven on it. 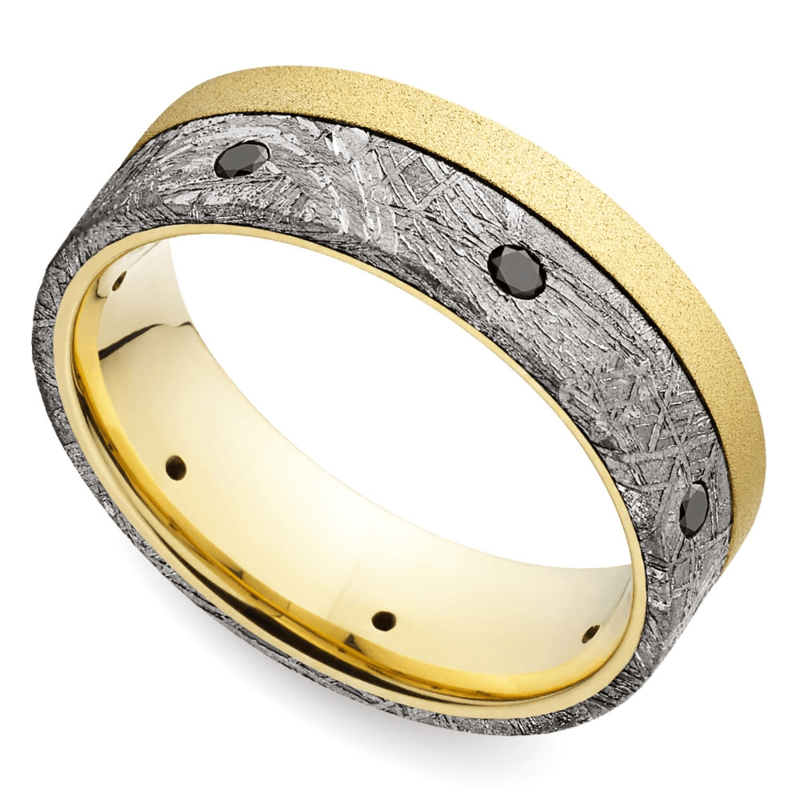 This ring, which pairs meteorite with warm yellow gold and striking black diamonds, was originally designed as a man’s ring. 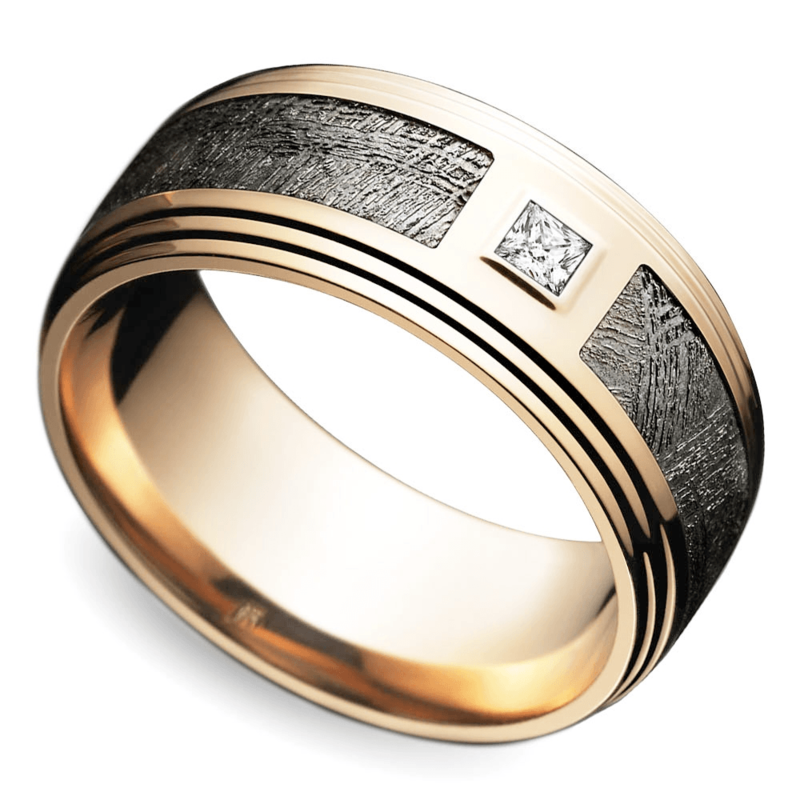 However, this beautiful combination could easily suit a woman; simply take a gold wedding band, inlay those meteorite pieces in the center, and embed black diamonds throughout. Just like that, you have a striking ring that any modern bride would die to wear. 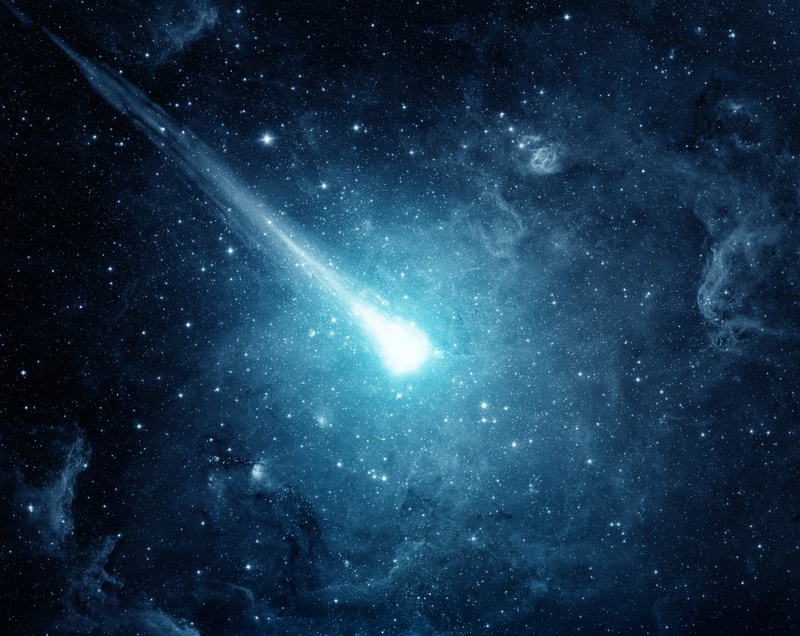 From a romantic perspective, a meteorite is a little piece of heaven that’s fallen to Earth. Instead of using a cheap pickup line like the hilariously classic, “Did it hurt?”, catch your girl’s attention with a ring reminiscent of the beautiful night sky by combining meteorite with a diamond. Similar to the ring pictured above, this beautiful piece could include a princess cut diamond and an inlay of meteorite, surrounded by a base of rose gold. Or, if you’re looking for a more “heavenly” look, try a white gold or platinum band! One of the great things about wedding and engagement rings these days is their individuality. No two rings are exactly alike – nor should they be, since no two women are exactly alike. The ability to customize a ring means that you get to embrace what you love about her, take those unique traits, and get creative as you make them manifest in her ring. Who knows? 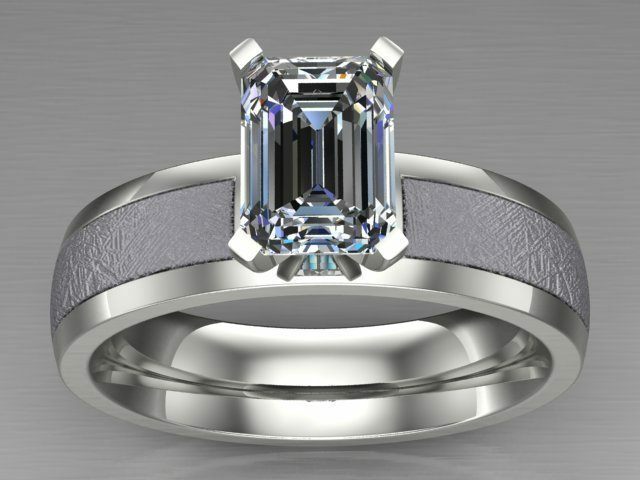 You may end up with something like this beveled ring. This square shape and the textures of the meteorite is so different from most rings out there, which makes it perfect for the creative type marching to the beat of her own drum. Just because the meteorite catalog only features bands, don’t think this limits the possibilities. If you want to get really creative, you can even incorporate one of these stunning Gibeon inlays into an engagement ring. Consider the solitaire ring pictured above, custom made for a very lucky woman. 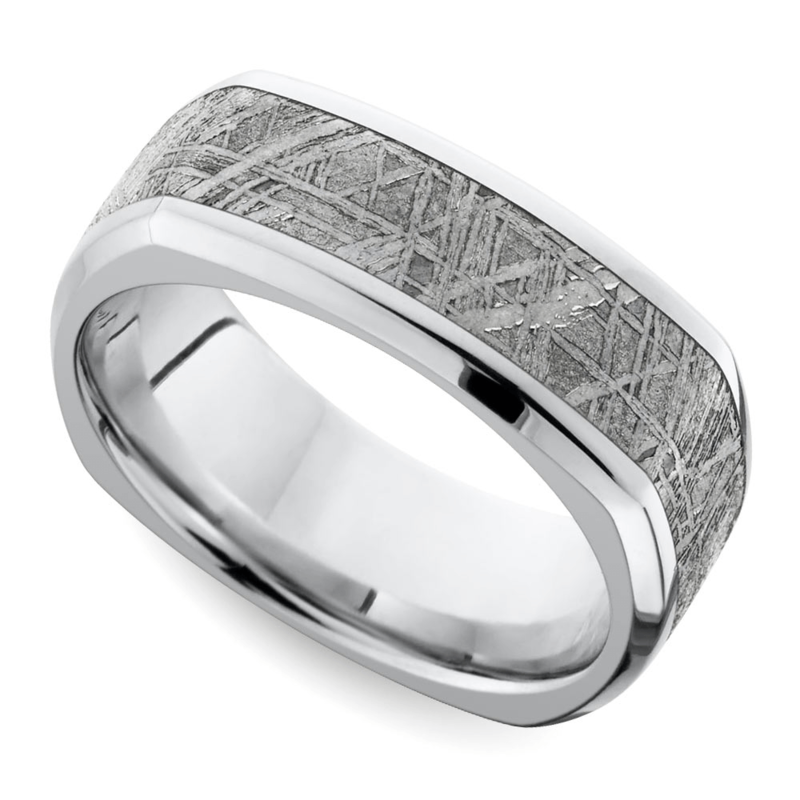 The platinum’s bright, white shine contrasts beautifully with the subtle gray and rougher texture of the meteorite. The center diamond is highlighted by this contrast, bringing even more elegance to the high profile setting. Make It Custom, Make It Brilliant! When you set out to buy a ring for a woman, we know how much she must mean to you. We know you think the world of her, and it’s high time she knew it. Meteorite jewelry is a wonderful way to let her know that she is one of a kind, and that your love will endure for as many years as this meteorite (that’s about four billion, by the way). Let us help you wow her with a beautiful meteorite ring, custom made by one of our designers.